Mr Bump is always having accidents, bumping into things and landing in holes. Littleaccidents and big accidents. Mr Bump was once carrying a ladder to fix his chimney pot, but smashed his living room window when he was turning round. When he turned to see what had happened, SMASH! went the kitchen window went as well. So you see, this happens quite a lot. When he tried to get a job, everything he did, he always had accidents and got the sack from every job, however he now works for Mr Barley in his orchard as an apple picker. He just walks around and soon enough he bumps into a tree and an apple falls down! • Mr Bump has a little sister , Little Miss Whoops, who visits him only once a year. 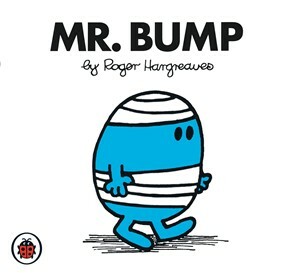 • Mr Bump went on holiday to think of a job he could get, but fell into a hole on the beach and landed with a crash and you guessed it A BUMP!